The Japan Foundation organizes the Japanese Studies Fellowships Program and gives preeminent foreign scholars in Japanese studies an opportunity to conduct research in Japan. One of the 2014 fellows, Ms. Alba G. Torrents, who has carried out her research "Technology, Body and Identity in the Imaginary of Anime" at Kyoto Seika University for a year from October 2014, has contributed an essay titled "Anime as (Particularly Interesting) Thinking Devices." Technology and its relationship with humanity have always been two of the most important topics in anime. Astro Boy, which is the first TV anime series, explored the life and adventures of a humanoid robot, and since then, in the nearly 50-year history of anime, we have seen all kinds of variations. As in other media, there seem to be two main ideals of technology in science fiction anime: humanoid robot, and dehumanized machine. But in a sense, the role of technology in anime is far more complex than this. Technology in anime is nothing similar to a robot nor a machine. In my work, I defend the idea that many anime can be considered to be what I call thinking devices, which means that they not only convey representations of robots and machines through a technical medium, but they are also devices themselves that think technology and other ideas with us. Some anime works appear to be particularly difficult to interpret because we find their elements, including out-of-place scenes, dialogues, backgrounds, and rhythms, are difficult to integrate in the narrative. These anime works led us to engage in a kind of reflection that would not exist without them. A classic example of them is Neon Genesis Evangelion. Because of its rupture with some of the conventions of the mecha genre and its general impenetrability, Neon Genesis Evangelion brought forth a massive amount of discussion and speculation dedicated to decipher its meaning, especially on Internet forums. We tend to believe that only humans are able to think, or at least to use some of the higher forms of thinking, like reflection. However, is this really true? Many people would object that some animals are capable of some kind of thinking, and some would even defend something similar about plants. We only rarely conceive other kinds of objects or processes as involved in thinking, and when we do, we tend to fall back to the two categories I mentioned above: tools that act as a mere aid for human thinking and full-fledged conscious robots with their own human-like personalities. The notion of thinking devices that I use in my study is in part a play of words, but points to a serious matter. It is supposed to mean both "devices for thinking" and "devices that think." It is something in the middle of an independent robot and a mere tool. One of the reasons why I like to talk about thinking devices is because I believe thinking, first and foremost, is a complex relation between entities, and sometimes deciding where to locate its agency (that is, who is doing the thinking) is not so simple. Animation as various "thinking devices"
We could think of a lot of systems as thinking devices. A building, for example, can be a thinking device because of the way it distributes spaces and different kinds of information that go through there, and it structures the interactions that happen inside and outside. Cultural products, especially artistic products, are particularly suitable to be interpreted as thinking devices. They not only have a capacity to make agents and information systems engage in mutual relationships, but are also potentially critical, that is, they have a capacity of modifying the ways we engage with the world in a significant way. Most cultural products are traditionally interpreted as texts. The difference between the idea of a text, which is traditionally understood as a vehicle, and that of a thinking device is great. The idea of text-as-vehicle produces a meaning of something that happens out of the text. The message is either something that exists before the text (maybe in the mind of the author) or something that will come to exist later (in the mind of the reader or viewer). When I talk about thinking devices, I refer to processes in which the production of the meaning is dynamically distributed. The meaning here is something that happens during the interaction between viewer and device, not a fixed message that is conveyed. This is part of what makes anime (which I understand primarily, according to Thomas Lamarre's analyses, as a technology of moving pictures intended to involve viewers cognitively) a particularly good example of a thinking device. In anime consumption, viewers and materials engage in a joint process of sense-making. The agency of this process, the "who does it," is shared. Anime is not just a tool or prime matter, but an active part in the process. Moreover, we find in certain anime (like Neon Genesis Evangelion, Revolutionary Girl Utena, Puella Magi Madoka Magica, and so forth) a kind of play between narrative and "extra-narrative" elements which reveal a way that an object can impose its rules to thinking, adding to the user agency. One of the most important features of narratives is that they must follow a certain order. A narrative is necessarily divisible in moments or parts, and these parts must follow each other in a particular way. In this sense, the parts of a narrative always constitute a closed set. But if we pay close attention to the anime works I previously mentioned, we can see many elements that escape this narrative order, points of rupture that cannot be fully accounted for from a narrative perspective. These points of rupture I call extra-narrative elements. Where the logic of the story itself works by producing some form of closed temporality, those extra-narrative elements break this closure and force the viewers to consider another type of temporality. One outstanding example of this is what happens in the episodes 25 and 26 of Neon Genesis Evangelion, where the linear story is abandoned and the standard temporality of the narration completely put aside in favor of something else. It is a critical attempt to think who watches anime and to make the viewers think. Also, narratives are always something of the order of the complete individual, that is, something always "already interpreted" up to a point. This does not mean, of course, that the reading process cannot itself be an open process. An element may always receive a new and different interpretation, and some of them may even be left uninterpreted. Properly speaking, the elements of a narrative (such as an anime story) are not narrative or extra-narrative in and of themselves as spectators are continuously "knitting them" into the narrative. However, the presence of elements that resist interpretation is part of what makes a piece work as a thinking device, giving it a particular form of criticality. Of course, this does not happen only in anime. For instance, many live-action films by directors, such as David Lynch and David Cronenberg, are full with this kind of elements. However, anime has some particularities that, again, makes it a more interesting example. First of all, in anime and animation in general, we are confronted with the characters actions directly. There are voice actors, but none of the gestures or visual actions depend on a live actor. This helps us get away from the standard relationship with characters in the performing arts, in which the reasons and emotions conveyed are supposed to be connected in some way to the subjectivity of the actors, even if they are "faking them." In anime is the medium itself, in relation with viewers, what express something. Secondly, one of the particularities of anime is that it relies heavily in repetition, in the reproduction of certain conventions. Anime works rarely lend themselves to be interpreted as expressing mainly the "interiority" of a given author, and even when they do up to a point, it is only through constant reference to the conventions of the anime itself. Even in the case of anime which are sometimes considered innovative or game-changing, like Akira, Neon Genesis Evangelion, or Revolutionary Girl Utena, their potential for critical transformation relies in the stance they take towards a certain genre and in the way they rethink its conventions. Through the repetition and alteration of conventions, the spectator is able to interact not only with anime as an individual product but also with it as a whole system. I believe that studying the way in which certain anime invite us to engage in a particular kind of reflection is not only new and interesting way to approach anime, or its relationship with the viewer. It is also important because, in the end, anime is not only a tool for entertainment or an object that we can passively observe, but also something that affects us and alters our ways of thinking. Approaching anime as thinking devices can help us understand their potential for critical thinking, as well as reconsider the whole relationship between anime and viewers. *1 Thomas Lamarre: Professor at McGill University. He translates numerous Japanese novels and reviews. He is also an associate editor of magazine Mechademia (University of Minnesota Press), which covers Japanese pop culture. 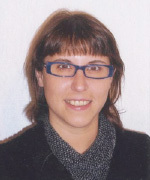 Alba G. Torrents is a PhD Candidate at Autonomous University of Barcelona and National University of Cordoba. The theme of her doctoral thesis is "Technology, Body and Identity in the Imaginary of Anime." Before starting her doctor's course, she obtained a master's degree in Contemporary Philosophy from Autonomous University of Barcelona. Her current area of research is "identity in anime through analysis of body, technology, and characteristics in anime." After doing her research with financial assistance from National Scientific and Technical Research Council of Argentina, she continued it at Kyoto Seika University as a fellow of the Japan Foundation Japanese Studies Fellowship Program. She wrote an article for Mechademia 9: Origins and an essay for Kyoto Seika University Kiyo, Volume 47 (to be published shortly).